Harley's sire is the stunning, stallion of a dog, Am/Can. MBIS Ch. Summer's Dash Riprock SOM (Dash), who was sadly taken from the Boxer world much too soon. I am very proud to be able to say that Harley and his five littermates are a result from Dash's last naturally sired Canadian litter. I want to thank Josie and Tom O'Reilly of Summer Boxers (Reg'd) for allowing me to breed my Ally McBeal to Dash Riprock. The future looks very promising for Harley and his littermates. Harley completed his Canadian Championship by going Winners Dog, Best Of Winners, Best Of Breed (for 3 points) & Best Puppy In Breed under Boxer Breeder judge Robert Verhulst at the Vancouver Island Dog Fanciers Association show on May 27, 2004! He was handled beautifully to these wins by Michelle Yeadon! Harley is the 1st Canadian Champion for his dam, Can. Ch. CynTech's Ally McBeal DOM (Allie), and the 6th Canadian Champion for his sire, Am/Can. MBIS Ch. Summer's Dash Riprock SOM (Dash)! Harley completed his American Championship by going Winners Dog and Best of Winners for 2 points under judge Lester Mapes at the Greater Clark County Kennel Inc. show in Hillsboro, Oregon on July 12, 2005! He is the first American Champion for his dam, Can. Ch. CynTech's Ally McBeal DOM (Allie) and the second American Champion for his sire, Am/Can. MBIS Ch. Summer's Dash Riprock SOM (Dash). Harley was expertly handled by Michelle Yeadon, Shelly Dueck, and others on the road to his American Championship. 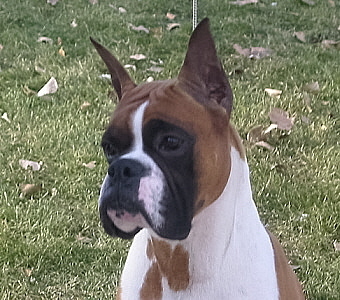 In 2004, Harley won the Alberta Boxer Club High Point Puppy Award (sponsored by Emberstouch Boxers) as well as the Glendora Trophy (sponsored by Mr. & Mrs. Wm. 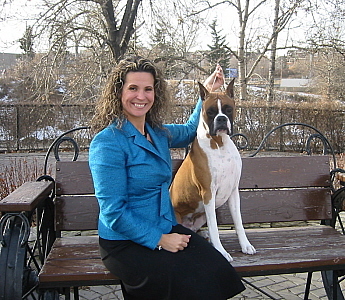 Langley) for the 2004 Boxer Club of Canada Top Boxer Puppy! Congratulations to his owners, Patti & Rick Bergstrom, and thank you for doing so much more than I would of expected with Harley! What a thrilling year it was for all of us, the Bergstrom's, Grandma Josie and myself, Harley's breeder and other Grandma! :-) Special thanks to Michelle Yeadon for guiding Harley to such great success in the ring as a puppy! Harley won back to back Award Of Merits during the 2005 ABC Regionals! 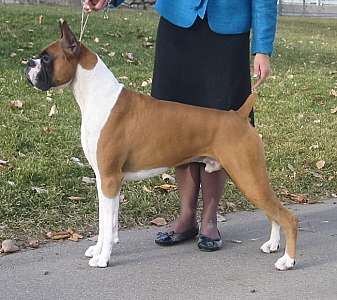 His first Award of Merit was under Boxer Breeder judge Eng Hong Teoh at the Orange Coast Boxer Club Specialty Show on November 10, 2005, and his second Award of Merit was under Boxer Breeder judge Sandy Orr at the American Boxer Club Regional Specialty Show on November 11, 2005, in Pomona, California. He was handled beautifully to both wins by his best friend Michelle Yeadon. Harley and his best friend/handler Michelle Yeadon competed in the breed ring at the 132nd Westminster Kennel Club in show at Madison Square Garden in New York on February 12, 2008, and almost made the cut! You can view him in the breed ring (he is the fifth male in) here. Flash! Harley finished 2008 as #1 Boxer, #2 Working Dog and #9 All Breed in Canada! He has retired in style and is now enjoying everyday life, including a large 2 acre yard to play in, with the Bergstroms on Vancouver Island. Harley looks forward to venturing back out to the conformation ring as a veteran in the future. Keep checking back for updates on Harley.